This deluxe 1 bedroom suite is ideal for up to 8 guests and offers all the modern comforts of home. Enjoy staying at the most luxurious accommodation in the Finger Lakes region with loads of amenities and activities that keep our guests coming back! • Access to a year-round outdoor pool & hot tub, a 24-hour fitness center, and Starlight Arcade. • Must try nearby Outdoor Adventure Centre with mountain roller coaster! 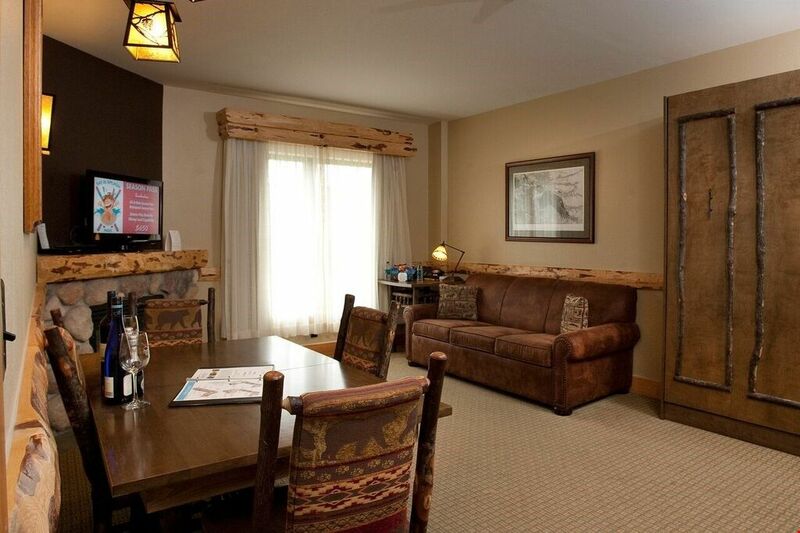 Stay in the cozy and comfortable Split Rock Suite, which features warm and inviting decor in an amazing location surrounded by mountains and lakes which are enhanced by amazing attractions and activities! There is 1 BEDROOM with 2 comfortable queen beds and luxury linens. There is also 1 queen-sized murphy bed in the living room as well as a queen-sized sleeper sofa. There is a walkout balcony from this bedroom with beautiful views and seating for 4. In the fully equipped KITCHEN, you will have everything you need to prepare meals in comfort and then enjoy them at the dining table with seating for 4. In the LIVING AREA sink into the comfortable sofa and warm up in front of the large river rock fireplace while you watch the flatscreen TV and take advantage of the free Wi-Fi. Note that the bedroom and living room have private entrances and you can lock the doors between the living room and the bedroom for extra privacy. There are 2 full BATHROOMS, the first is ensuite to the bedroom and features both a shower and bathtub, the second has a shower and is adjacent to the living room. This beautiful property is located at the Hope Lake Lodge which is a luxurious, upstate hotel, beautifully situated on Hope Lake in the Virgil Valley of the Finger Lakes Region. Boasting a "green" status, this property offers tons of excitement and adventure paired with amazing amenities, relaxation facilities, and a complimentary valet. You have access to the year-round outdoor pool and hot tub as well as a state of the art fitness center open 24-hours a day with cutting-edge Precor equipment. After a day enjoying the outdoors, dine at the Acorn Grill or the Bobcat Lounge before heading to the Starlight Arcade. On-site, for additional charges, you may enlist a professional to help you relax at the Waterfalls Spa or experience the Cascades Indoor Water Park with a wave pool, three-story tube slide, body slides, indoor & outdoor hot tubs, and an activity pool. If you have little ones then the Bearfoot Den Activities Center will be an exciting adventure with crafts, games, and other fun activities in the mornings (fees may apply depending on the activity). You will never run out of things to do at Hope Lake/Greek Peak Mountain. Not only is Greek Peak Mountian an amazing ski hill, nearby there is the Outdoor Adventure Centre which offers a myriad of activities including a year-round MOUNTAIN ROLLER COASTER, aerial ropes course, euro bungee, and snow tubing (our personal favourite)! There is a 9-hole disc golf course around scenic Hope Lake for your enjoyment. The Nordic Center at Hope Lake is the perfect setting for cross-country skiing, snow-shoeing, and hiking the Finger Lakes Trail. Golf, tennis, collegiate sports, wine tours, sailing, fishing & water skiing on Cayuga Lake are all wonderful experiences. Don't forget your state park access where you can hike the gorges, enjoy outdoor movie theatres, ice skate, horseback ride, berry pick and visit Hollenbeck's Cider Mill. Additional charges may apply depending on the activity. great location and at first appearance, nice room and layout. Horrible guest services, unresponsive general manager and lack of cleaning provided. 2 of the main mattresses were so soft and old that they caved in at the middle. Our backs are not in good shape after 3 nights. Lighting was horrible. Lodge amenities were nice and skiing was great. I was double charged, once by the owner/management company and again by the lodge after check out! Unacceptable all around. Still waiting for a live phone call and this to be corrected. Not a great way to end vacation. Ideally located in Central New York, Cortland combines an idyllic country atmosphere with an excellent proximity to lively and exciting metropolitan cities like Philadelphia, New York City, Boston, and Toronto! Cortland is the perfect vacation destination for every season. From skiing and nordic trailblazing in the winter, to hiking and golfing in the summer, experience all that Cortland has to offer. In the evenings, spend time tasting local wines or whiskey, and enjoy some local delicacies. Avoid cabin fever by visiting historical museums and experiencing award-winning theatre and music. Featuring a colourful array of festivals and fairs year-round, you are sure to be kept smiling on your holiday!